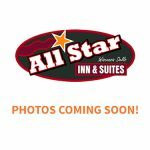 Lodging – Wisconsin Dells Lodging at All Star Inn & Suites – Wisconsin Dells, WI. No weight/size restrictions for common housepets (dogs and cats). Other pets by management permission. Cancellations: In the event you must cancel your reservation, your deposit will be refunded (less a processing fee of $10 for most rooms and $20 for the kitchen suite) provided your request is received by 4:00 pm, 3 days prior to your reserved arrival date. Less than 72 hours’ notice will result in forfeiting your deposit. 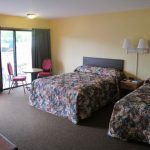 Two-night minimum may be required on some weekends, based on season and availability. Room rates INCLUDE all amenity, resort and parking fees. Treat yourself to our Serta Prestige King Bed for added comfort. A large room w/ additional seating on the first floor. 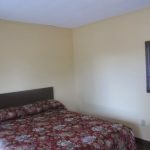 Includes refrigerator, microwave, in-room coffee, 32" flat screen TV and 36" vanity w/ granite vanity top. Sleeps 1-2 guests, rooms 15 or 28. Treat yourself to our Serta Prestige King Bed for added comfort and an extended view. Located in a large room w/ additional seating on our 2nd floor (no elevator). 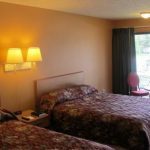 Room includes refrigerator, microwave, in-room coffee, 32" flat screen TV and 36" vanity with 3 drawers and granite vanity top. Sleeps 1-2 guests, rooms 31 or 45. Serta Prestige Plush Queen Bed, refrigerator, microwave, in-room coffee and 32" flat screen TV. A small room, but still many of the amenities of our largest rooms. A popular choice for guests on a budget. Located outside of our main two story building, all are on the ground floor w/ parking right by your door. These are rooms 1-14, located close to our office in our two single stand alone buildings. Sleeps 1-2 guests. Two Serta Prestige Plush Queen Beds, refrigerator, microwave, in-room coffee, 32" flat screen TV, plus 36" 3 drawer vanity w/ granite countertop. A large room located on the 1st floor. Always a popular choice for all our guests. Sleeps 2-4 guests. Two Serta Prestige Plush Queen Beds, refrigerator, microwave, in-room coffee, 32" flat screen TV, plus 36" 3 drawer vanity w/ granite countertop. A large room located on the 2nd story (no elevator) closer to our sundeck w/ a view of the pools / property. May also be rented adjoining, based on availability and must be booked via phone to insure adjoining rooms. Sleeps 2-4 guests per room. Perhaps our most preferred room choice... we refer to this room type as "Home Base." 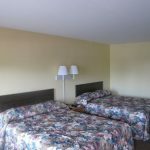 Consists of Two Serta Prestige Plush Queen Beds in the main room which are separated by a curtain wall for a bit of added privacy. Second bedroom has One Serta Prestige Plush King Bed. 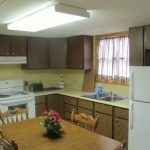 Also includes a complete kitchen w/ 30" electric stove and full size refrigerator w/ freezer, kitchen table and chairs, double sink and all of your cooking utensils, table ware, cookware. Covered patio seating right outside your door. This is room 30, sleeps 3-6 guests. May also be rented adjoining w/ room 2 Queens (room 29) to sleep 4-10 guests. Please phone to inquire and reserve.